This past Saturday was my first time trial. 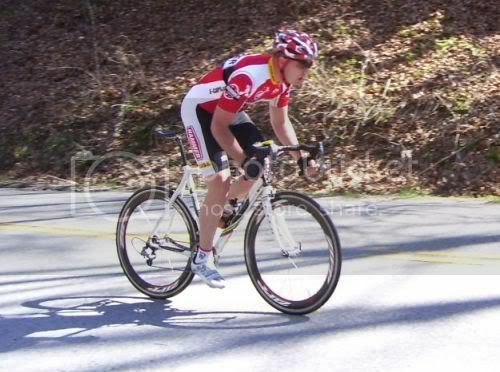 This wasn't a true race, it was actually a club function for the Charleston Wheelers. Some of the people came out just to kind of ride it but about 10 - 15 of us came out to race. There were some pretty nice bikes that I hadn't seen out lately, apparently we have some triathletes in our area. One bike was particularly sweet, a Cervelo Soloist carbon with tubular 404's on it. Very sweet! Anyway, when we first made it there at 8:30 to warm up it was 41 degrees. A little chilly. A few of us did a short warm up which resulted in me flatting. Better to flat warming up then racing I guess. Luckily I was carrying a tube so that made it nice, what made it nicer was this one had an 80 mm valve stem so I didn't have to use the zipp adaptor, very nice! I think it was the adaptor that led to the flat. I think I had way to much air in my tires but couldn't be sure because the adaptor kept giving me false readings. Anyway, we finished up the warm up and it was time to start. The course was 7.4 miles with 1,335 feet of climbing. It started off with a 1.5 mile ride to the end of the forest which was a very slight downhill. After that you turn around and ride about 3 miles up a false flat with a couple of very small rollers before the first of two climbs. The first climb is about 1 mile, then a small downhill about 0.25 miles, a nasty false flat uphill that goes about 0.5 mile then a 1 mile climb to finish up the time trial. My start time was 10:30 am and it had warmed up to around 65 degrees or so. Perfect! The time came and I took off. I gave it everything I had from the start and hurt surprisingly well, I was happy. On the "flats" I managed to pass two of the riders that started ahead of me but not the rider who started directly in front of me who happened to be a friend of mine that I train with. The climb came and I stood up and gave it everything I had. I was hurting and in the back of my mind I kept telling myself to take it easy, I had a mountain bike race the following day. I didn't listen! I made it up the first climb and was feeling pretty well. Now it was time for the downhill, I just kept pedalling until I ran out of pedal. Now it was time for the false flat, holy crap that thing hurt! I felt like I was just going to fall over, I kept going. Now the final climb started. I dropped the gears and started giving it all I had. I managed to go up a couple of gears from my normal, that felt good. I was feeling pretty good about myself, next thing I knew with about 1/4 mile to go I saw my buddy in front of me, great, a rabbit to chase! I went harder, I caught him about 1/8 mile to go and passed him. I managed to put about 25 seconds on him, not too shabby I guess. Once I went around the final curve I stood up and just sprinted with about 300 yards to go and still going uphill. I'm sure it wasn't all that impressive of a sprint to the spectators but to me it felt awesome! Once all was said and done I finished the time trial in 21:23 (minutes:seconds). I averaged over 20 mph which surprised me. The winner's time was 21:19, I got second. I am happy with that considering the winner was a cat 3, very strong and definitely in shape! Once I finished up I had to jump in the truck and drive three hours for Sunday's mountain bike race. That report will be up shortly but since I doubt any of you will wonder over to the mtb forum I'll give you the clif note version. I managed to get my first win in the sport class after being in it for over three years! Here's a picture from the first climb. Sorry it's not better but this was cropped from a pretty large picture. I think it was those wheels! NICE!!! congrats on the time trial. that is amazing. i don't think i will ever be able to time trial well, something to do with my skinny legs. i bet it was nice having the zipps. If anyone is interested here is a link to Sunday's mountain bike race. Is that in Kanawha State Forest? Yeah, that's where it's at. They paved the road on out to where Middle Ridge (fire road) crosses the main road on the top of the hill. We used to go from where Clark and Davis Creek intersect, into the park for 5 miles and back, for the monthly "flat" TT. The hill climb TT used to alternate between Mt Alpha, and Foxchase. just think, if you went gloveless you would have won. There have been some pretty good times up the Mt Alpha time trial in the past. I need to figure out where the "start" sign is and where the "finish" mail box is and time myself on that one. I did my three minute hill repeats on Fox Chase last week. That hurt!!! That, and if his shorts weren't a size too big. Just curious, how is my skinsuit a size to big? Last edited by LowCel; 04-23-07 at 10:49 AM. Or if I would have spent another day training at some point. Nice job Bruce! That seems like a pretty darn good time for all the uphill? Will we see you at Rabbit Hash next week? Thanks. Next week I will be out of town from Friday until Sunday working with our family business. No racing for me. Timing actually ended up working pretty well since this is my rest week. I need one, legs are getting a bit heavy on me. congrats bruce! looking mighty good with those zipps!